By choosing the right types of door knobs, you can capture a surprising amount of convenience and elegance for such a small detail. With this guide, not to mention its expansive collection of door hardware, Schlage makes it simple to bring security and style to your home. Give yourself some extra privacy with a locking bed & bath door knob. Perfect for bedrooms, bathrooms, home offices and otehr interior rooms requiring basic security and privacy. Locks by pushing in or turning the privacy button, unlocks by turning the knob. Schlage bed & bath locks come with emergency pin key for easy unlocking. Install convenience with non-locking door knobs in passageways or on closets. Ideal for hallways, closets, kitchen pantries, laundry rooms and other spaces where locking is not necessary. Always unlocked for ease of entry. Can be paired with a smart lock or keyless deadbolt on exterior doors or with non-turning knob for the interiors of smaller closets. Find great style with non-turning door knobs on interior doors where only a door pull or decorative trim is needed. Also known as dummy or inactive door knob. Works best on small closets, interior French doors and in other entryways where neither locking nor latching is needed. Decorative door pull without a lock makes it easy to open the door just by pushing or pulling. Increase your security with a keyed entry knob for exterior doors and other areas requiring additional peace of mind. Optimal for exterior doors such as front entryways or patio doors as well as large storage areas, basements or areas where extra security is desired. Unlocks when door is opened from the inside, allowing you to leave quickly and conveniently as well as re-enter easily. Use a key from the outside or manually rotate the interior turn button to lock and unlock. Your home should evolve with the needs of your family, so Schlage Custom™ Door Hardware features combined interior door knobs, making it easy for your locks to adapt to your changing lifestyle. You get both Hall & Closet and Bed & Bath functionality in a single lock. For even more help choosing the right door knobs for your home, visit our product selector tool on schlage.com. To view the full resolution infographic, click here. Please include attribution to schlage.com with this graphic. At Schlage, we believe that our knobs, levers and entryway deadbolts are not only among the most stylish, but also strong. We also believe that, above all, our locks should work how you want them to, no matter what door you put them on. They should make your life more convenient and give you peace of mind that you and your home will be secure. Here’s how to get the right locks for doors of any kind. When you think of the oasis spaces in your home – bedrooms and bathrooms, where you don’t want to be disturbed – you likely want some extra control over who can enter. For these types of rooms, you want a knob or lever with the Bedroom & Bathroom, also known as privacy, function. Install Bed & Bath locks in a master suite as well as in guest bedrooms and powder rooms. Interior privacy locks are also ideal for home offices so you can keep interruptions at bay while you’re in work mode. You want your door to latch, but you don’t need to protect your cereal? Then you want a passage lock, also known as Hall & Closet. For particularly small pantries and closets that aren’t walk-ins, you might want a knob or lever on the inside that is non-turning. Door hardware on the exterior side of your door grants access without an unnecessary locking function and lets you maintain your home’s style. One of the great features of Schlage Custom™ Door Hardware is 2-in-1 functionality. By inserting the privacy pushpin, you can easily switch between the bedroom/bathroom and the hall/closet functions. Why is this important? Anyone with a sticky-fingered toddler or an increasingly independent teen knows that sometimes you need to update your home as your family changes. It can also be helpful if the purpose of the room itself changes, such as converting from a media room to a nursery. Pocket doors are great for opening up room – think seamless and versatile transitions between formal dining and living rooms – or when you’re tight on space like with a tiny half-bath. These types of rooms need different locks. If you’re looking for additional privacy, like in that small bathroom, look for a pocket door lock. If locking isn’t a concern, look for a pocket door pull, essentially a simple grip for opening and closing the door. They come in a variety of styles and finishes to complement the look of your room and to fit flush to the door. French doors are an elegant option for both interior and exterior entryways. For interior French doors, you may need two types of locks – a different one for each door. If you aren’t sure if you’ll need two non-turning knobs or levers, or if you need one privacy lock and one non-turning, use our guide for how to choose locks for French doors. For exterior French doors, you’ll need the same cross and latch bore holes as interior doors as well as an additional bore hole to house a deadbolt for extra security. Choose between a single cylinder or double cylinder deadbolt based on your desired level of security. Remember that French doors are actually two doors. You’ll need four knobs or levers to outfit your entire entryway, although you might choose for some of them to be non-turning, also called dummy or inactive. For exterior doors, start by deciding between mechanical or smart locks. A smart lock like our new Schlage Encode™ Smart WiFi Deadbolt with built-in WiFi gives you remote access from anywhere, no hub required. You can simply use a smartphone app to lock or unlock your door, create and manage up to 100 unique guest access codes, and even pair your deadbolt with home automation systems or hands-free devices for voice control. That’s added convenience and security all in the palm of your hand. Don’t forget about the door from your garage to your house. This is a great place to add any of our smart locks or a Schlage connected keypad. If traditional mechanical door hardware is more your taste, a handleset combines both a deadbolt and your choice of a knob or lever. It’s the perfect combination of security, style and simplicity as handlesets come in several designs and finishes. 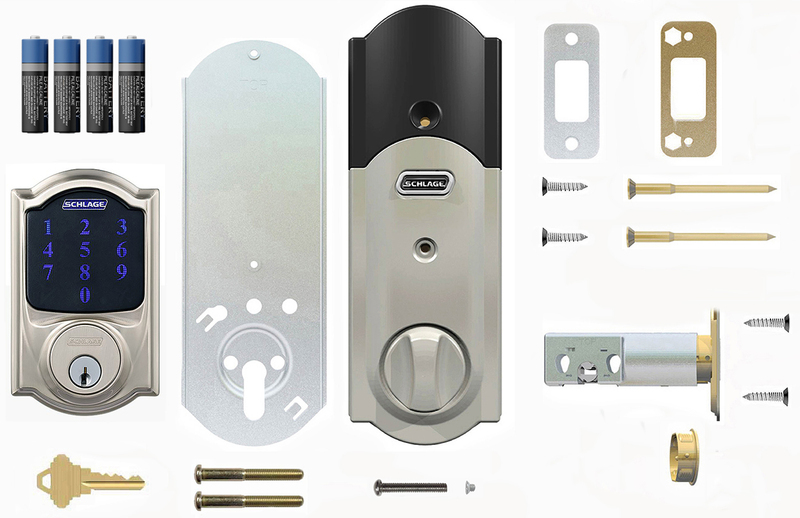 Schlage locks are also designed to fit all standard doors, so installation is easy. Even installing a smart lock is simple since there is no hardwiring required and no need to call an electrician or handyman. Not all entryways are created equal, so if you have an exterior Dutch door, there are a few more things to keep in mind. First of all, you’ll need four hinges – two for the top half and two for the bottom half of your split door. The knob/lever and lock should be installed on the bottom half. If you want even more security, especially for exterior doors, a deadbolt can be added to the top. Finally, you’ll want a latch to connect the top and bottom halves of the door to each other. This might sound like a lot, but installation is easier than it sounds, and a DIY Dutch door can be quite economical, giving you a big style bang for not much buck. There is no one-size-fits-all home, so why would you expect one type of lock to work on every type of door? Visit the Product Selector tool on Schlage.com for help finding the perfect lock for your doors or follow us on Pinterest and Instagram to find the door hardware that seamlessly complements your home and lifestyle. Treat your hardware like a coffeemaker – Learn to spot quality door locks. When shopping for new home good items, it pays to understand when it’s worth saving and when it’s worth the splurge. When shopping for new home good items, it pays to understand when it’s worth saving and when it’s worth the splurge. Take coffeemakers for example. If we use them every day, it might be worth paying a little extra for a model that not only is going to last but also will save you time and money in the long run. If your coffeemaker turns out to be sub-par, you’ll ultimately end up spending more on a replacement or by heading to the coffee shop. So much for savings. What does this have to do with door hardware? You won’t want to give up coffee cold turkey because your at-home maker isn’t up to snuff, nor will you stop wanting to lock your doors for the same reason. Do your research and think about the following factors when considering the move up to the next tier of locks and door hardware. They might make you re-think defaulting to the lowest price. You’re going to use your locks every day, and it’s important that they work every time. With Schlage, you can be assured that not only will your locks and door hardware last for years to come - reducing the need for frequent replacements - but they’ll also help protect your home throughout their lifespan. Nearly all of Schlage’s mechanical hardware and electronic deadbolts, levers and knobs are rated best in security, durability and finish by BHMA. Testing shows that our hardware is resistant to the toughest environmental and weather conditions, and levers hold up under heavy weight, so you know you’re covered when a child hangs on them. Premium metal construction also provides a quality you can actually feel. Our smart locks also feature the same type of encryption used in online purchases and built-in alarm technology to consistently protect what’s most important to you. Similar products: Toilet plungers and car tires. You probably won’t find out that they aren’t working until it’s already a problem. And you definitely don’t want that. You’re going to look at your door hardware every day. Front-door locks and hardware are some of the first things guests will see, so you might want something visually appealing that also matches the style of your home. Schlage Custom™ Door Hardware features architecturally-inspired designs that reflect your unique taste. With our collection of styles and finishes, the possibilities offer a whole new dimension of personal style to your home. Smart locks like Schlage Sense™ Smart Deadbolt and Schlage Connect™ Smart Deadbolt come in a variety of styles and finishes as well, making it easier than ever to coordinate your hardware from your front door to the back porch and everywhere in between. Similar products: A good blazer and hair dye. Just like quality door hardware, these are simple ways to elevate your style by changing what people see first and most. Installing your door hardware and locks, not to mention using them on a regular basis, should be easy. Most of our door hardware requires just a screwdriver for installation, and with our patented Snap & Stay technology, there’s no need to juggle components and tools at the same time. Schlage smart locks are also battery-operated, eliminating the need for hardwiring or calling an electrician during installation. Using your lock should be easy, too. Storing multiple access codes, locking and unlocking your door remotely from anywhere, and monitoring access through an app are just some of the hallmarks of Schlage simplicity. If ease is a high priority for you, this might be one reason to increase your investment. Similar product: Home delivery. How often have you paid a little extra for the pizza or groceries to be brought directly to your front door, just for the ease and convenience? When you have a question about your locks or door hardware, you shouldn’t have to go on a wild goose chase for answers. We put solutions at your fingertips with online support ranging from frequently asked questions to installation and user guides, templates and more. Similar product: Food service. When wait staff is attentive, friendly and knowledgeable, you know you’ll get the dining experience you deserve. “You get what you pay for” is cliché for a reason. Confidence in getting what you want from your locks and door hardware might be worth the investment to you, particularly when it comes to the safety, simplicity and style of Schlage. For continued help and support in your door lock buying journey, be sure to reach out to us on Twitter or Facebook for help.